Once considered an important Westport “mansion of the gay nineties,” the Schaefer home stood at the corner of Pennsylvania and West 39th Street Terrace – previously known as Schaefer Street. After the pioneer family sold the property, it became a boarding home for children, especially those with single mothers who worked. The home has long since been razed and replaced by an apartment complex. An important homestead once stood where the south edge of the Valentine neighborhood touches Westport, near what is now the parking lot of the Sunfresh grocery store. The home of Westport pioneer George Schaefer proudly occupied the corner of Pennsylvania and Schaefer Street (now known as West 39th Street Terrace). The family built the home in 1886 and lived there until the Junior League leased it as a boarding home for children in 1922. As part of our Uncovering History Project, the Midtown KC Post is taking a look at each block in Midtown, including a set of 1940 tax assessment photos which is available for many blocks. (Many people seem confused by the tax assessment photos, which all include a man holding a sign. Here’s the story behind them). 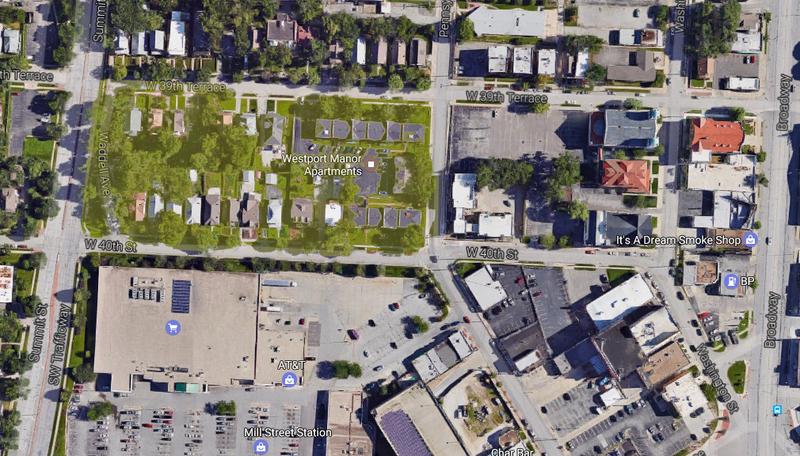 Today we look at the block bounded by West 39th Street Terrace and 40th Street between Pennsylvania and Southwest Trafficway (previously known as Summit Street). A recent view of the block. 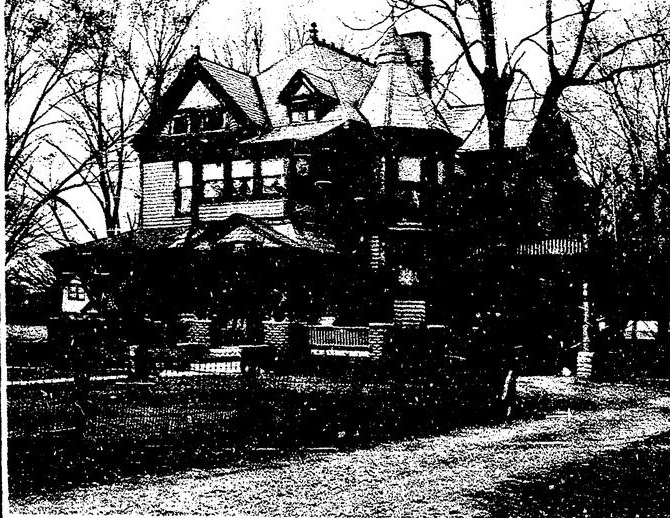 The Schaefer Mansion stood at the corner of Pennsylvania and the street that became known as Schaefer (now known as 39th Street Terrace). Other homes filled in the western side of the block in the early 1900s. Map from Tuttle & Pike Atlas, 1907. German immigrant George Schaefer came to Kansas City when he was about eleven years old and settled with his parents at 12th and Main. His father made a good living as a blacksmith and taught young George the trade as well. After his father’s death, George ran meat and feed grain business on the downtown lot, later erecting the Bernheimer building and the Household Fair building there. In 1886, George Schaefer built his family a home at 3922 Pennsylvania on a large tract. The family used a spring on the grounds of the nearby Allen School grounds as a water supply. The mansion was unusual in that Schaefer built it of frame rather than brick; it was reported that in the early stages of construction, there was a severe windstorm. “The storm decided Mr. Schaefer in favor of frame instead of brick, for he felt the building was on the edge of the prairie, where there was little protection from wind and bricks would be more dangerous in the event of a destructive storm,” according to the Kansas City Star on May 20, 1926. The home was known as one of the most beautiful in Kansas City, and was also famed for its large, beautifully landscaped lawn. 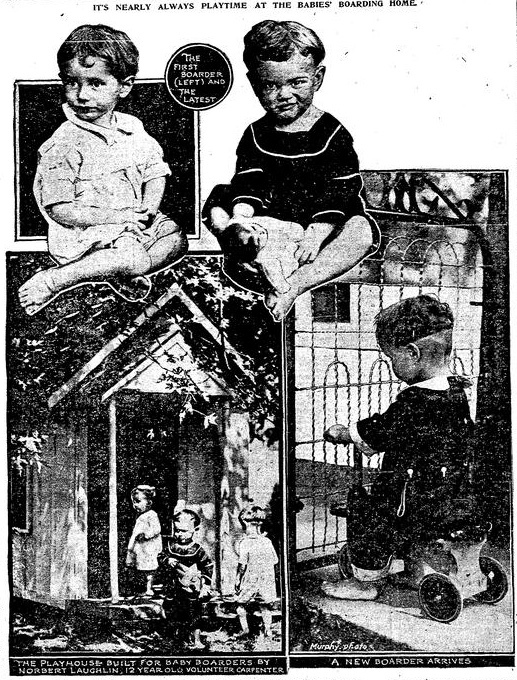 In 1922, with the Schaefers moving on, the Junior League leased the mansion to solve what was seen as a growing problem – the care of fatherless children whose mothers were required to work. Records are sketchy about when the house was razed. It was sold in 1926, but the owner had no plans to tear it down at that time. The 1940 photos do not show anything on the site, but an apartment complex now occupies the old Schaefer tract. Rows of homes filled in othe block, fronting on both 39th Street Terrace and 40th Street beginning in the early 1900s. Among those who lived there was the family of former Kansas City alderman Amos Townsend, who lived at 641 W. 39th Terrace from at least 1911 to 1924. During that time, the Townsend home was the site of a well-reported gun battle which took place after the ritz Priests of Pallas ball at the downtown convention hall. 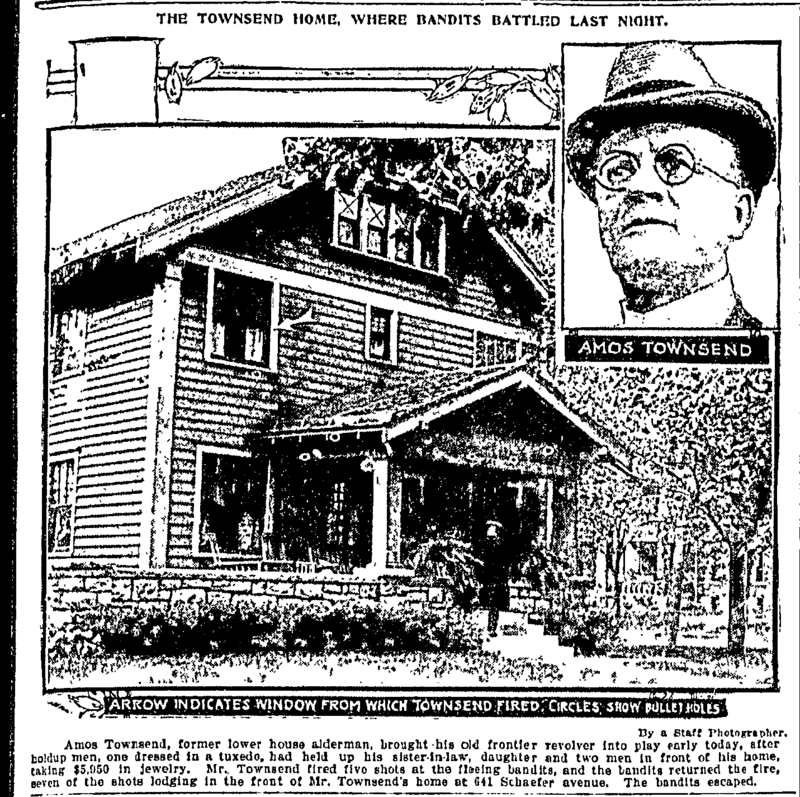 A newspaper drawing of the Townsend home and the bullets lodged in it after the gunfight, from the Kansas City Star, Oct. 5, 1922. Townsend’s sister-in-law Mrs. Fred Wolf, Miss Marquarite Townsend, Fred Wolf, Jr. and Joseph Collins ate dinner at Union Station after the ball and then drove to the Townsend home on Schaefer Street at about 2:30 in the morning. A young robber wearing a tuxedo and carrying a revolver approached them and, along with two accomplices, took almost $6000 worth of jewelry from them, including a watch, diamond ring and earrings. The activity woke up Amos Townsend, “formerly a mining engineer in Mexico in the plainsmen days.” He kept a six-gun in his house. As the bandits drove away, Townsend opened fire and the robbers fired back. One of the bullets was embedded in the wall of the house. The slideshow below shows the rest of the buildings on the block as they looked in 1940.